Well. 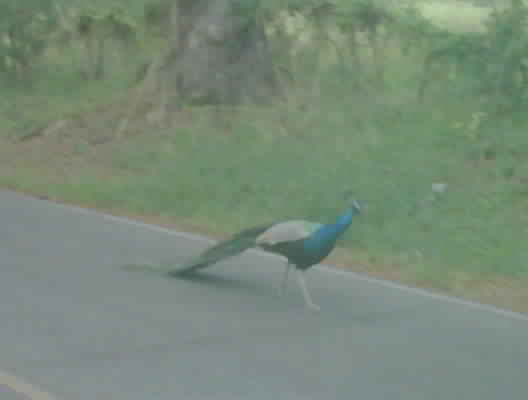 Why wouldn't there be a peacock on the road?!? Ok. Be prepared for jealousy. I began my day at the Domino Club where Jewels made me my favorite breakfast (scrambled eggs with cheese, 2 strips bacon, 1/2 biscuit with sausage gravy, and 1 blueberry pancake). Then I went to the grocery store to buy beer and ice which I placed in that big red bucket in the picture. Stopped at Kmart to get some cash back (often more reliable than ATMs which tend to run out of money on the weekends) then drove home and stored all non-necessary items and put on a swimsuit before heading with the dogs down to a beach party for some friends who got married last thursday. I was hangin out with some work folks when I was asked to retrieve my little hibachi grill. Off I went to my house (5 minutes away) and picked up the grill and dropped off the dogs. Back to the beach and I set my co-worker (James) to lighting the grill. He is an eagle scout and seemed disheartened that I had not brought any form of lighter fluid (or grain alcohol). I said–"use some of the tortilla chips, there not as good as fritos for lighting fires, but they work okay." He looked at me shocked and said, "that works?". I replied, "you're and eagle scout and you don't know about the flammability of fritos?". He came back with, "no, eagle scouts always have white gas with them.". I said, "well, hippies always have crunchy corn-based snacks." I think that was one of the funniest conversations ever–but then again, I find most things humorous. Shortly after that I took off for another west end snorkel tour. This is a 2 hour tour which I happen to love. I have seen sea turtles, stingrays, tons of fish, coral, etc. Today the only large thing I saw (on the tour) was a stingray, but the fish and coral were awesome. Then I swung back to the party before running home and grabbing the dogs and returning to the party for a 3rd time. Sitting with nice people watching the sunset, the dogs play, and for a very memorable 10 minutes–dolphins leap– has got to be one of the most pleasurable things in the world. I came home with the pups, happy, relaxed and tired. 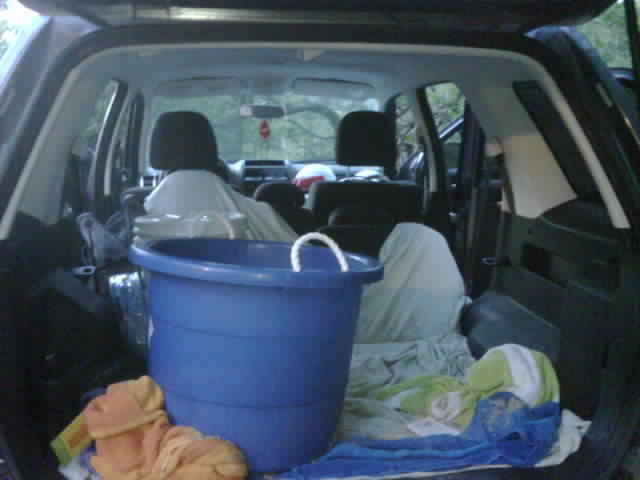 My car was a mess; stuffed with snorkeling equipment, bucket of leftover iced beer, used towels and sand–hence the picture which I thought was a good visual of my day. After emptying the car I made some dinner and now I'm heading up to bed after a little tv. >All of the comments about this are like “how could this happen!?”. Well, since we are pushing refineries at capacity and further…, well, it happens. I am just glad no-one was hurt. A massive explosion rocked the Sunoco refinery in Claymont, Del. late last night, sending flames shooting into the sky and initially raising concerns about residents’ safety in Pennsylvania, Delaware and South Jersey. Shortly before midnight, a company official said Sunoco and local fire officials were fighting the blaze and that no injuries had been reported. Although there had been early talk of possible evacuations, none took place because any possible harmful ingredient of the chemical that was released into the air – ethylene – burned off, said Cpl. Jeff Whitmarsh, a spokesman for Delaware State Police. “We’re very fortunate and grateful there were no injuries,” said Thomas Golembeski, a spokesman for Sunoco, at what was a chaotic scene at the Claymont facility of Sunoco emergency response officials, local firefighters and harried residents. Residents reported hearing one or two explosions that rattled car and house windows at about 10:15 p.m. Flames could be seen as far away as Philadelphia International Airport. Collison and a union official said there had not been an explosion like this for a long time, perhaps decades, in the heavily industrialized area. Police blocked off roads around the bi-state refinery, one of the largest in the Northeast in a heavily populated area just off I-95. It is major producer of gasoline and chemicals. There was initial confusion about the origin of the explosion, but it appeared that it took place in a small part of the refinery in Claymont Del., just south of the main refinery in Marcus Hook, Delaware County. There were also mixed reports over what type of chemical was airborne. TV initially reported the chemical in the explosion as ethylene oxide, a toxic material used in auto antifreeze. A Sunoco official later identified the chemical as ethylene, a byproduct of oil refining used to manufacture plastics. Sunoco officials did not have an official cause of the fire. The explosion came three days after Pennsylvania fined the Marcus Hook refinery $762,150 in civil penalties for air-quality permit violations. The problems were discovered in tests done by Sunoco in 2006. Inquirer Photographer David Swanson contributed to this report. >I'm am about 90% certain that my neighbor just got taken away by "men in white coats". Okay, so they weren't wearing white coats but it had that feel to it. He was acting exceptionally weird today. >Today (saturday) was an idyllic day. It started out with a delicious breakfast at the Domino Club (aka "Norma's" aka "Beer Drinking Pig"). Jewels is the breakfast chef–and it is so good I go back every saturday. Oddly Jewels lives just down the road from me, she has a sweet American Bulldog named Missy. Anyone who bakes and cooks like she does is someone I am happy to have as a neighbor. Then I went snorkeling. I joined up with SCUBA's west end tour. I saw a sea turtle–I swam next to it. It is so freakin' cool. This west end tour was not as interesting as last time because we stayed in one place. But it was still darn spiffy. 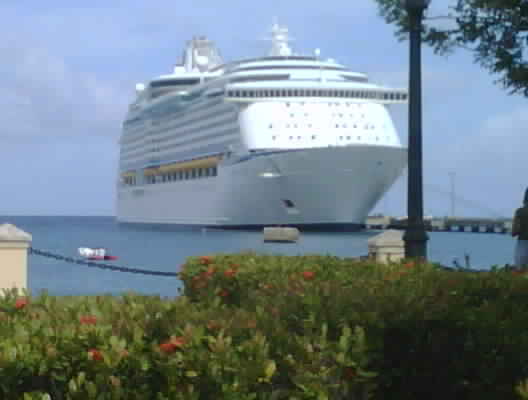 Because there is a cruise ship in port we couldn't snorkel at the pier. But F'sted is a busy town when the ships are in. Steel drums, booths selling tourist stuff, and a party atmosphere. After snorkeling I came home and ate a quick lunch and then set up dinner in the crock pot. Now I am settling in for a nap. Cruise ship is in port today. So. 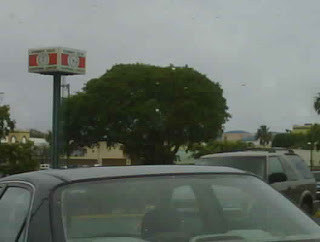 Having just gotten out of work this is a picture of the drive through at Wendy s.